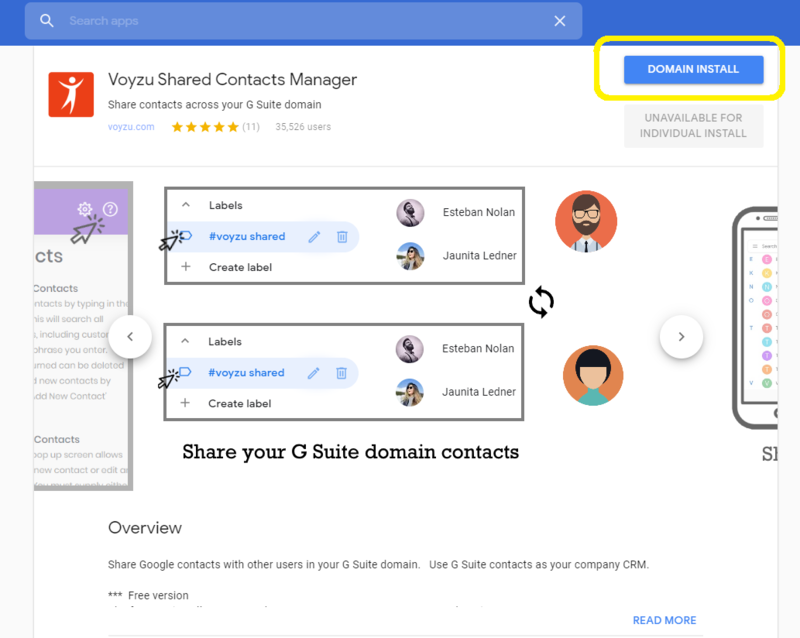 Follow this link to install Voyzu Contacts Directory for G Suite. Only 'Domain install' is supported as voyzu needs access to your domain-wide contacts. After launching Voyzu you will be taken to the Voyzu login screen - select your G Suite administator account and log in. Once you have logged in for the first time, Voyzu is now active and available to all users on your domain. You can control access by clicking the 'Users' menu item. It can take a short while for Google to sync install data. If you receive this warning immediately after installing voyzu then wait a minute or so and try again. I receive an error message saying "Please check that Voyzu Contacts Directory has data access granted for domain"
Ensure data access has not been revoked. 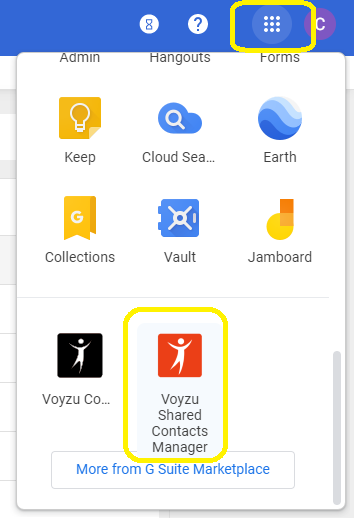 In G Suite admin navigate to Google Admin Console > Apps > Marktplace apps > Settings for Voyzu Contacts Directory > Data access. Make sure Data access is 'Granted'. It is also important that the service is "ON". Check that a domain administrator has installed Voyzu and has logged in at least once. I receive an error message: "You do not have permission to access Voyzu." Your Voyzu G Suite administrator has not granted you access. Contact your domain admin and request access. I receive an error message "Please log in using your primary domain email address"